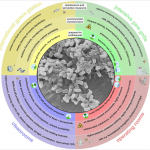 New papers on Microbiology of the Built Environment, October 15, 2016 – microBEnet: the microbiology of the Built Environment network. Indoor environments, where people spend most of their time, are characterized by a specific microbial community, the indoor microbiome. 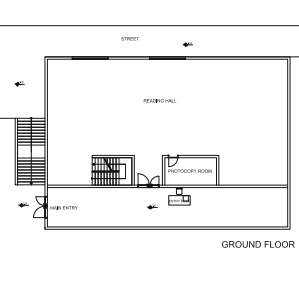 Most indoor environments are connected to the natural environment by high ventilation, but some habitats are more confined: intensive care units, operating rooms, cleanrooms and the international space station (ISS) are extraordinary living and working areas for humans, with a limited exchange with the environment. 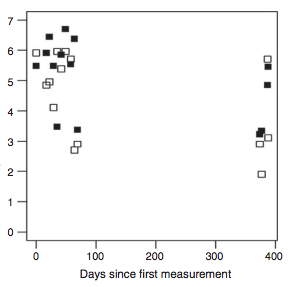 (…) In this article, we summarize the available data on the microbiome of aforementioned confined habitats. 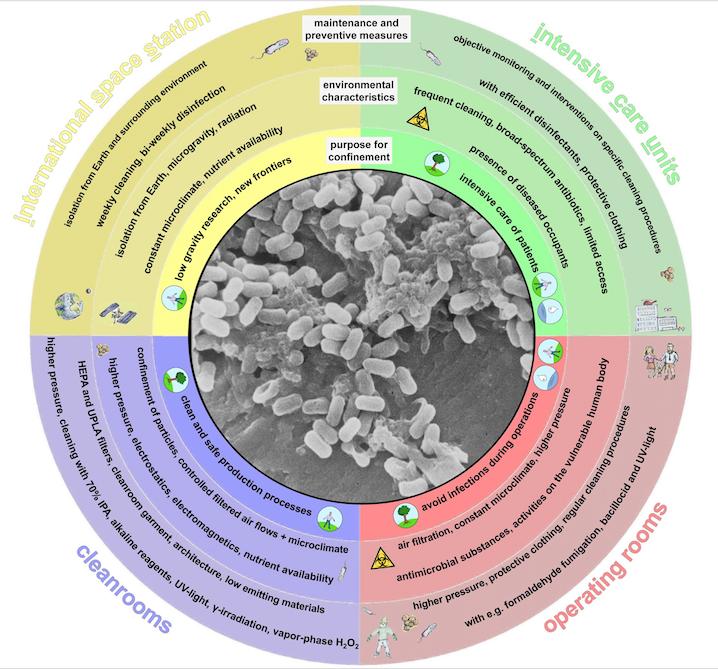 By comparing the different operating, maintenance and monitoring procedures as well as microbial communities therein, we emphasize the importance to properly understand the effects of confinement on the microbial diversity, the possible risks represented by some of these microorganisms and by the evolution of (antibiotic) resistances in such environments – and the need to reassess the current hygiene standards. 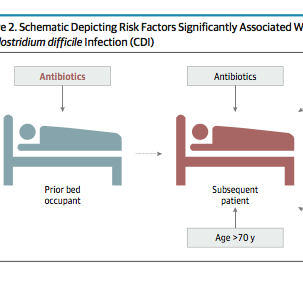 To assess whether receipt of antibiotics by prior hospital bed occupants is associated with increased risk for CDI in subsequent patients who occupy the same bed. This is a retrospective cohort study of adult patients hospitalized in any 1 of 4 facilities between 2010 and 2015. Among 100 615 pairs of patients who sequentially occupied a given hospital bed, there were 576 pairs (0.57%) in which subsequent patients developed CDI. Receipt of antibiotics in prior patients was significantly associated with incident CDI in subsequent patients (log-rank P < .01). 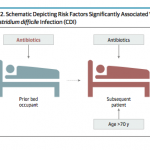 (…) Receipt of antibiotics by prior bed occupants was associated with increased risk for CDI in subsequent patients. Antibiotics can directly affect risk for CDI in patients who do not themselves receive antibiotics. Health problems in people who are in indoor environments with poor ventilation have resulted in an increase in the number of studies regarding air quality. 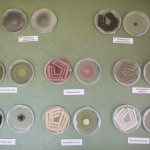 Microorganisms and inferior indoor air-climatic conditions not only affect human health but also cause decay of invaluable materials present in libraries. Therefore, this study aimed to assess the culturable bioaerosol composition and concentration in the library of Istanbul University. The culturable fungal flora, a biodeterioration agent, of the damaged archival materials was also examined. The air was sampled for a year, as were the surfaces of 207 biologically damaged books. (…). The highest amount of fungus was determined in Archive 3, which contained damaged books. The fungal species isolated from the air and books were essentially the same. Therefore, it is important to determine not only the numeric values but also the microbiological composition of fungal colonies because the variety of fungal species is indicative of a deterioration process in effect over a long period. The deterioration of books must be remedied. 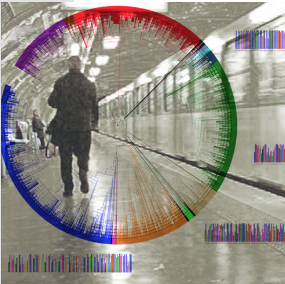 A vast international study is being undertaken to classify, using metagenomics, the bacteria that dwell in the underground transport systems of 50 cities across the globe. (…) The aim of the operation, repeated several times throughout the day of June 21, 2016, at the entrances of several Paris metro stations, was strictly scientific: to identify the microorganisms that have taken up residence in this suburban environment. This unprecedented study is part of an international consortium framework dubbed MetaSUB (link is external).1 The project, which will be used to create microbial maps of the underground transit networks of the world’s largest cities, already includes 53 international megalopolises including New York, London, São Paulo, Tokyo, Berlin and Shanghai. On Aug. 26, the Dragon space capsule dropped into the Pacific Ocean somewhere off the coast of Baja California, Mexico. Onboard were payloads containing fungi that had now grown in two of the most extreme conditions known to man: outer space and the Chernobyl Atomic Energy Station. These fungi are radiation resistant. Thirty years ago, they survived when a routine test led to an explosion that blasted radioactive material throughout northern Ukraine. By sending these fungi to the International Space Station, Kasthuri Venkateswaran, a research scientist at NASA’s Jet Propulsion Lab, and Clay Wang, a professor at the USC School of Pharmacy, have tried to push them to adapt again. New sanitization methods have been evaluated to improve food safety and food quality and to replace chlorine compounds. However, these new methods can lead to physicochemical and sensory changes in fruits and vegetables. The present study evaluated the effects of acetic acid, peracetic acid, and sodium dodecylbenzenesulfonate isolated or combined with 5 min of ultrasound treatment (40 kHz, 500 W) on strawberry quality over 9 days of storage at 8 °C. The strawberry natural contaminant microbiota (molds and yeasts, mesophilic aerobic and lactic acid bacteria), physicochemical quality (pH, total titratable acidity, total soluble solids, vitamin C, and color), sensory quality (triangle test) and inactivation of Salmonella enterica subsp. 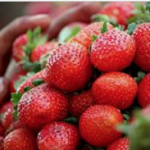 enterica intentionally inoculated onto strawberries were analyzed. (…) Moreover, synergistic effects were observed in contaminant natural microbiota inactivation for all tested compounds during storage, without any major physicochemical or sensory alteration to the strawberries. Therefore, ultrasound treatment can improve the effect of sanitizers that are substitutes of chlorine compounds without altering the quality of strawberries during storage. Peatlands play an important role in global climate change through sequestration of atmospheric CO2. Climate-driven changes in the structure of fungal communities in boreal peatlands that favor saprotrophic fungi can substantially impact carbon dynamics and nutrient cycling in these crucial ecosystems. In a mesocosm study using a full factorial design, 100 intact peat monoliths, complete with living Sphagnum and above-ground vascular vegetation, were subjected to three climate change variables (increased temperature, reduced water table, and elevated CO2 concentrations). 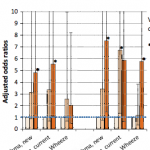 (…) Since fungi play a central role in peatland communities, increased abundances of saprotrophic fungi under warming conditions, at the expense of reduced fungal richness overall, may increase decomposition rates under future climate scenarios and could potentially aggravate the impacts of climate change. 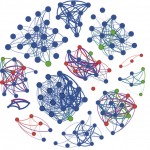 Co-occurrence OTU network based on correlation analysis. (…) Here, we investigated the ecological relationships between the three domains of life (i.e., Bacteria, Archaea, and Eukarya) using 454 pyrosequencing on the 16S rRNA and 18S rRNA genes from chronically impacted and pristine sediments, along the coasts of the Mediterranean Sea (Gulf of Lion, Vermillion coast, Corsica, Bizerte lagoon and Lebanon) and the French Atlantic Ocean (Bay of Biscay and English Channel). (…) OTUs forming the core microbial community showed the highest sensitivity to changes in environmental and contaminant variations, with salinity, latitude, temperature, particle size distribution, total organic carbon (TOC) and PAH concentrations as main drivers of community assembly. 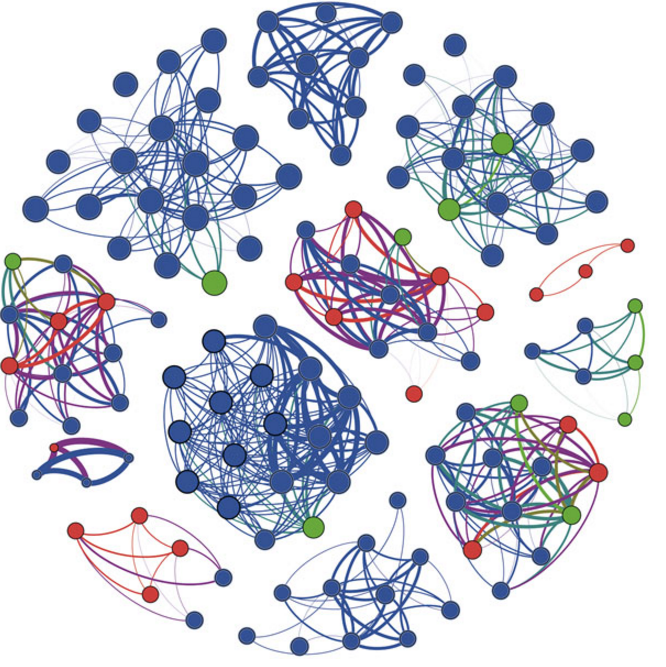 (…) Comparison of network topological properties between contaminated and non-contaminated samples showed substantial differences in the network structure and indicated a higher vulnerability to environmental perturbations in the contaminated sediments. 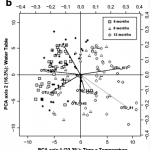 The aim of this study was to characterize the nitrogen transforming bacterial communities within a partially saturated vertical subsurface flow constructed wetland (VF) treating urban wastewater in southern Brazil. 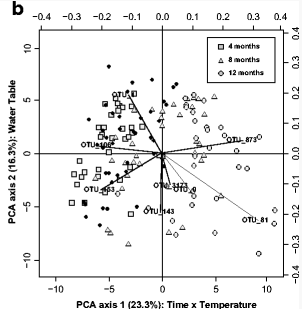 (…) The nitrifying and denitrifying bacterial communities were characterized in wetland cell 3 (764 m2 surface area) over a period of 12 months by using the FISH technique. (…) Based on the identified bacterial dynamics, the partially saturated VF wetland operated under low OLR enabled favorable conditions for simultaneous nitrification and denitrification. 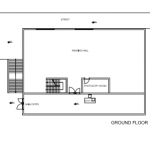 This study evaluated treatment of greywater (GW) by a biochar filter in Jordan and assessed the annual risks of infection (Pi-annual), annual risk of disease (Pd-annual) and disease burden (in disability-adjusted life years; DALYs) of gastroenteritis caused by Salmonella spp. and rotavirus due to ingestion of GW during system maintenance and consumption of green onions irrigated with treated and nontreated GW. (…) The highest risks of gastrointestinal disease were thus associated mainly with direct ingestion of GW when maintaining the system. Garden produce irrigated with GW treated in biochar filter did not display intolerable risks of rotavirus‒based gastroenteritis during summer season in the study area given that the produce is harvested 1 to 2 days, and washed, before consumption.